· First period (mid 17th century): the beginnings. The influence of Herrera (Escorial) and the transition to the new models coming from Italy. · Second period (last third of the 17th century and first of the 18th): plenitude. Churriguera brothers, Ribera, Tomé, Figueroa developed a decorative language; architecture becomes more dynamic. · Third period (rest of the 18th century): continuity and change. Rococo style, with evident French and Italian influences developed thanks to the change of dynasty. Herrerian models lasted due to the great influence of the Escorial. The architecture of palaces is homogeneous. The kind called Austrian has towers on the sides of the façade, cover with chapitel and roof of slate (pizarra). There were severe buildings from the outside even when the inside was very comfortable. The structures of the churches are very simple, with encamonades domes and Jesuitical plan (a nave and chapels in the buttresses), with austere decoration. The interiors are filled with golden altarpieces that are becoming more complicate with the time. From mid 18th century the Italian influence is limited. 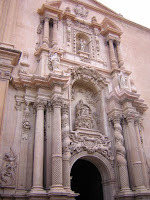 In the outside the facades are conceived as the altarpieces. This style is more decorative and lasts until the first decade of the 18th century, under the direction of the courtesan architects who work for the Bourbons. 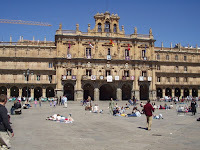 Worry about urbanism, with the development of major squares (Valladolid, Madrid, Salamanca). They tend to be rectangular, with porticos and balconies. ·Juan Gomez de Mora: Madrid Square, Madrid Council House. 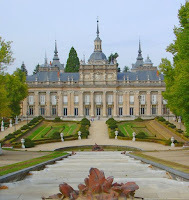 · Sabatini: Aranjuez Palace · Juvara: Madrid’s Royal Palace.